I - SINGLE STATION BELT FINISHER - This unit is designed to aid in the finishing of a wide variety of shapes and sizes of ware. For maximum versatility the finishing belt speed is easily adjustable from 60 RPM to 700 RPM. The proper speed is simply dialed in by the operator or supervisor. This unit is also equipped with its own self contained water pump and reservoir. The water flow is adjustable from 0-2 gpm. With more than 12" of sponge surface to work with you can finish even the largest items. The unit plugs into a standard 110 volt outlet and is free standing. Belt changes can be done in less that 2 minutes. With few moving parts, clean up and maintenance are minimal. Money back guarantee - If within 30 days of purchase you are not satisfied with the quality and/or labor savings provided by the SINGLE STATION BELT FINISHER, RAM will refund the purchase price less a $100.00 clean up charge. All return shipments must be sent prepaid. II - SINGLE STATION ROTARY FINISHER - Model 4501 - Unit is designed to improve productivity and improve finishing of a wide variety of shapes and sizes of ware. For maximum versatility the finishing sponge speed is easily adjustable up to 160 RPM. Proper speed is simply dialed in by the operator. This unit is also equipped with its own self contained water pump and 20 gallon reservoir. Water flow is adjustable from 0-50 gph. A retractable squeegee is provided to clean sponge surface and control moisture level. The unit plugs into a standard 110 volt outlet and is free standing. 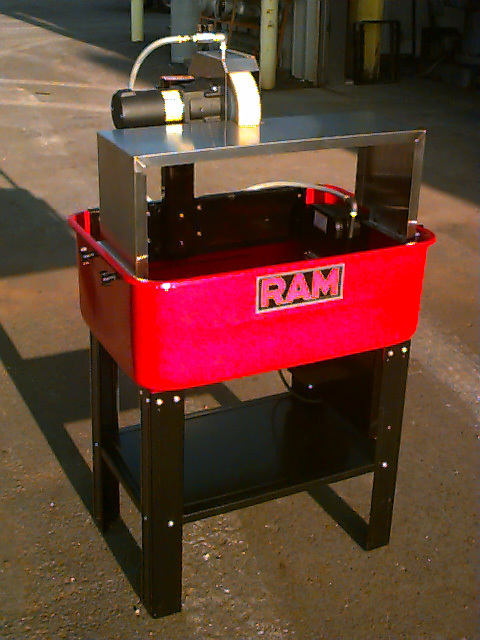 Single station rotary finishing machine comes with an adjustable stainless steel table for finishing tiles, bricks, etc.. The table can be easily removed to allow finishing of functional ware and irregular shaped parts. Sponge changes can be done quickly, with out the use of tools. With few moving parts, clean up and maintenance are minimal. The cost of this unit FOB Columbus, Ohio is $1795.00, shipping weight is approximately 150#. III - FOUR/SIX STATION ROTARY FINISHING MACHINE - This unit is designed with high production output in mind. The operator loads and removes the ware from the front station. The finishing sponge and fettling blades are located at the back stations. The rotary table can be cycled every 1-60 seconds. All movements and speeds are variable, including table rotation, sponge rotation, and water flow. Output on the four station unit will average 200 - 700 pcs/hour, depending on the size of the item and how long the sponge must be applied. This unit is designed to finish round and oval shapes. The ware can be held to the rotary table by plaster, or rubber chucks. The machine can be set up for item changes in less than five minutes. The Finishing Machine is mounted on casters this allows the unit to be easily moved to the location of the ware. The unit runs off of a standard 110 volt outlet. It is equipped with its own self contained water pump and reservoir. The reservoir can also be plumbed to a drain. Units are designed to be run continuously with very little maintenance required. The FOUR/SIX STATION ROTARY FINISHING MACHINES can also be coupled with conveyor and spray systems to make complete production lines.